LEN - www.lankaenews.com | President’s ‘golden’ railway project- President in collusion with cabinet secretary cheats cabinet wholesale ! Commission greed knows no bounds !! President’s ‘golden’ railway project- President in collusion with cabinet secretary cheats cabinet wholesale ! Commission greed knows no bounds !! 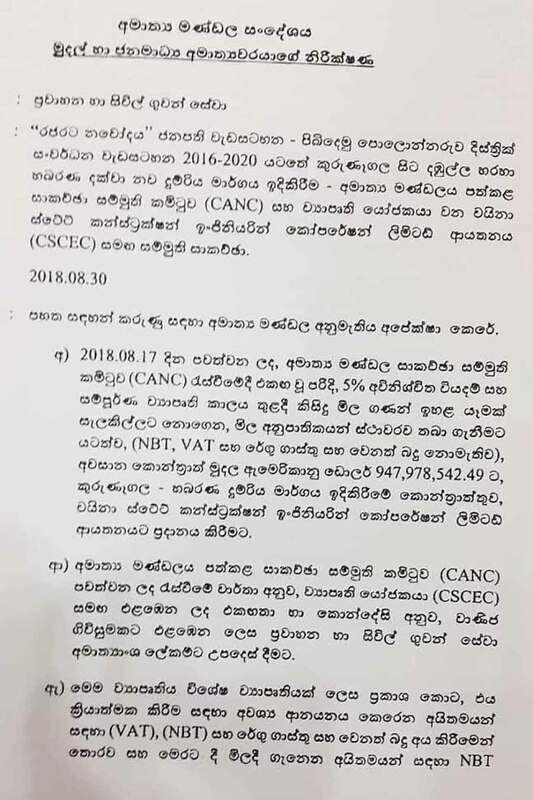 (Lanka e News – 15.Oct.2018, 11.10PM) President Gamarala has perpetrated a grave fraud intentionally with his full knowledge against his own cabinet based on evidence and facts that have now come to light. It is very unfortunate Lanka e news which always espouses and exposes the truth come what may is again saddled with the unsavory task of posting this most abominable news against the swindling president of the country despite being the highest in the hierarchy . While the cabinet has not given the approval to the project , the president has stated ‘ approval was given’ to commit the fraud. This is a serious misrepresentation and a deliberate lie which warrants an immediate CID investigation. Lanka e news has already published a report on the railway line to be constructed under the program ‘Pibiduma Polonnaruwa’ of the president , which report also revealed, when Rs. 20 million is the cost to construct the line covering a distance between two sleepers, a whopping Rs. 161, 160 million is going to be unnecessarily spent to lay an unnecessary railway line between Dambulla and Habarana. This is obviously a massive scam of the president to earn the maximum commission quickly and illicitly before the ‘50 weeks’ lasting president is sent home packing . This is a scam of the president aimed at earning billions without calling tenders duly , along with his wheeler dealer son in law and ‘Access Sumal ‘ after enlisting a corrupt Chinese Co. 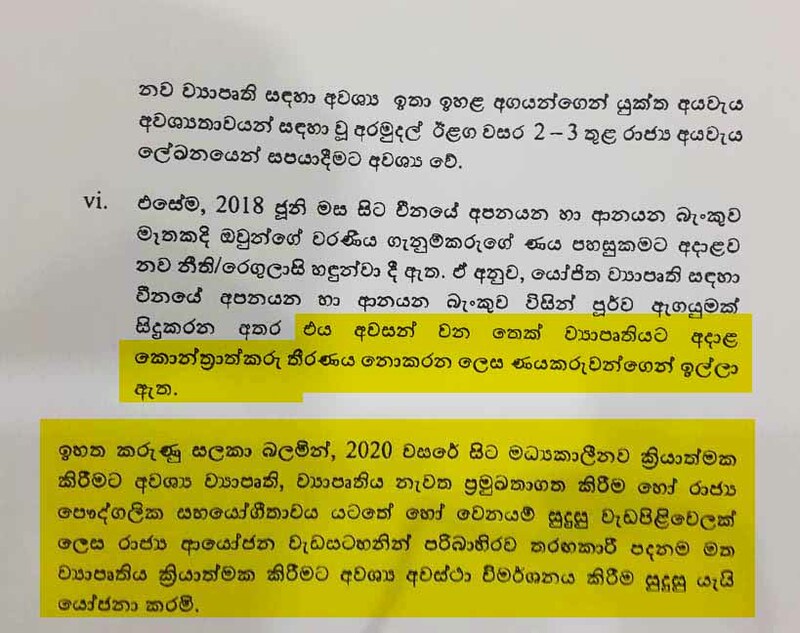 The Finance ministry which studied this, informed cabinet in writing (highest foreign loan installments to be paid during the two years) , because monies have to be spent heavily on a number of expressways during the next two years , this project shall be put on hold until after 2020 as a medium term project. Besides in the finance ministry recommendations it is stated , this project shall be done following tender procedures duly rather than without such procedure. 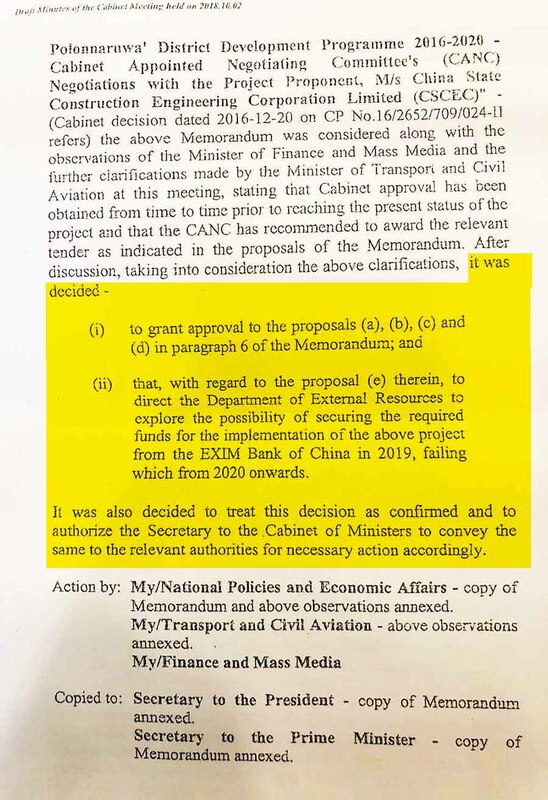 In addition the finance ministry recommendations states , the Chinese export import Bank itself which is granting the loan has requested not to decide upon the Chinese contractors right now in respect of the new project. 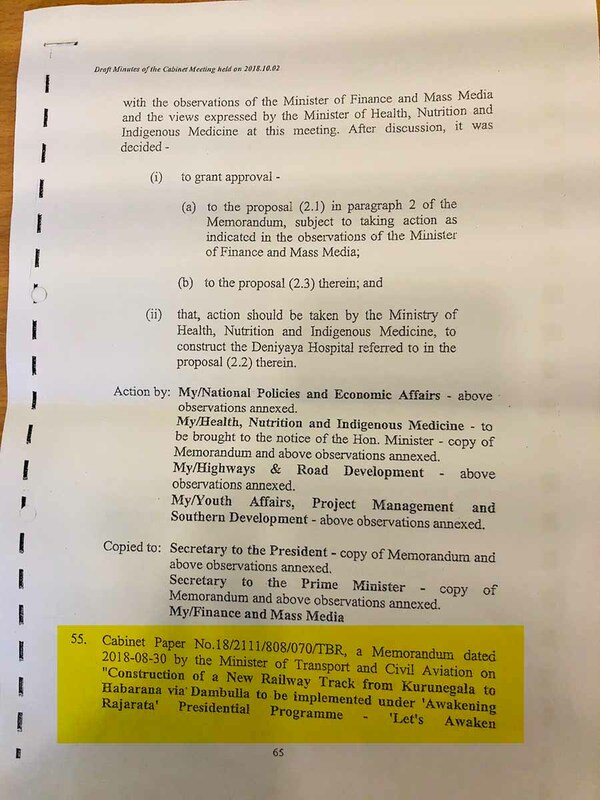 Hence finance ministry has pointed out , the first five grounds in the cabinet paper tabled by Sirisena for the construction of the ‘golden’ railway line have to be appraised further . The Finance ministry forwarded its recommendations to the cabinet on 2 nd October. If this ‘golden’ railway line defying all procedural norms was to be constructed after 2020 , President Gamarala would be relegated to the confines of his home by then and his sordid aim to line the pockets will be out of reach. 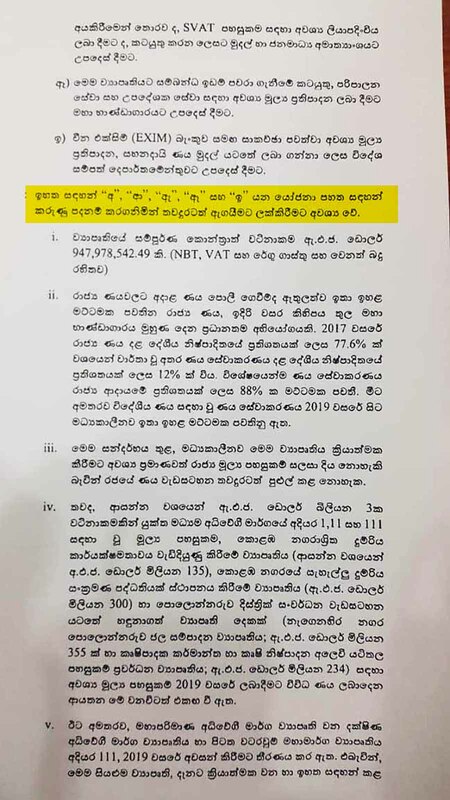 Therefore what Gamarala did was , he got around the cabinet secretary while casting aside the Finance ministry recommendations, lied ‘ cabinet approval was received ‘ and prepared a bogus report. This spurious report is herein. While the Finance ministry has clearly stated this project should be carried out only after 2020 , in the report of the cabinet secretary pertaining to the 2nd October cabinet meeting , it is mentioned , the cabinet approval had been obtained for it. (It is highlighted in yellow in the English report ) . In the circumstances , a grave fraud has been committed by the president whose venal objectives (illicit commission greed) are so overriding that he had sacrificed precious national interests at the altar of his self seeking selfish aims and agendas. The cabinet secretary shall be questioned on the preparation of this phony report at president’s request , and put behind bars. It is for the cabinet to take a decision whether it can continue to repose faith in such individuals who commit frauds even compromising the parliament . Hence , firstly , a complaint shall be lodged with the CID . Next an impeachment motion shall be tabled in parliament against the president for his fraudulent intentions and actions directed against the cabinet.